During the winter, you’ve probably noticed some homes have lots of big, long icicles hanging down from their gutters. 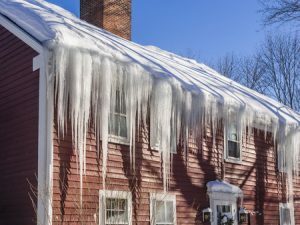 While this may look pleasant to the eye on sunny days, because icicles are spectacular, it’s actually not a good thing for the house or building. An “ice dam” is what can form at the edge of a roof where ice accumulates during certain wintertime weather conditions. This dam, if it gets too big and heavy, can literally break the roof and/or get inside the home, causing damage. Meanwhile, it puts too much stress on gutters and downspouts, probably damaging them too. Why do ice dams form? If an attic is warm, it can help melt the underside of the layer of snow on a roof. Water then trickles down between the layer of snow and the roof shingles, reaching the eave of the roof. Eaves typically extend beyond the side of the house, so they’re going to be much colder. That trickling water ends up freezing there. Over time, it grows into a heavy mound of ice. Besides eaves, a build up of ice often occurs in cold gutters. When snow and ice builds up high in a gutter, it makes a perfect foundation for an ice dam. Why are they a potential issue? Think of it this way: ice dams are like mini-glaciers on your roof! And you know what glaciers did to the earth many years ago, right? They carved out valleys and more… So with ice dams, some of the problems that can happen include water dripping into insulation (and down into ceilings/exterior walls beneath the eave) as well as ice pulling shingles and gutters off the building as the ice moves. Meanwhile, should that huge chunk of ice melt, parts of it can fall off the roof and onto shrubs below, or cars, people and pets. Just like you wouldn’t want a broken tree branch hovering above you, it’s not a good idea to stand underneath a giant ice dam! How do you rectify the issue? If you do get an ice dam, one way to deal with it is to remove it by breaking it free in small chunks using a blunt mallet. You might lose some shingles in the process. Also, you might want to climb a ladder and clean out gutters and downspouts, too. Rather than use rock salt, use calcium chloride ice melter. You can also buy and use a “snow rake” (or a broom/plastic shovel) to scrape snow from the roof so it doesn’t build up over time. To prevent ice dams from forming, though, the best action to take is sealing all points where warm air leaks from your attic into the spaces immediately below the roof sheathing. Proper insulation, whereas the conduction and convection of heat through the ceiling is prevented, will help prevent ice dams. And, finally, vent the space between insulation and roof sheathing, which allows heat to be smartly carried away. If you need roofing services in the East Stroudsburg, PA area, learn how Roofing by Bruce can help.